The air you breathe inside a home or business plays a large role in your overall health and impacts the health of anyone else who spends any amount of time inside the building. The experts with LIBERTYAIR know that even in a partially rural area, maintaining indoor air quality (IAQ) is key to your health. That's why our HVAC company offers the following five easy tips for improving the IAQ in your Alachua home or business. Using an air purifier — or two — is a great way to improve the indoor air quality of your home or business in Alachua. 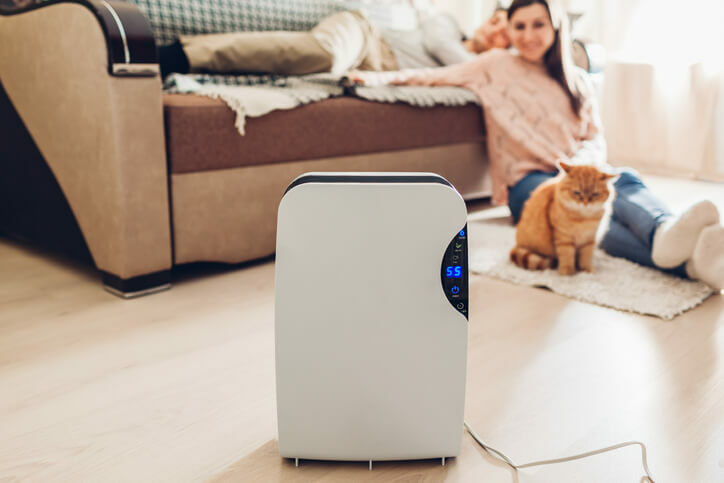 An air quality device uses fans to pull the indoor air through a series of specialty filters, removing any airborne bacteria, pollen, spores, and other harmful particles. Plus, they come in a wide variety of sizes and can be used individually or installed inside your HVAC system. Managing humidity levels inside your home might sound advanced but it's actually quite doable. Ideally, the indoor humidity should be between 40 percent and 50 percent. If the level is above 50 percent, it encourages mold and mildew growth which reduces the IAQ. Humidity levels below 40 percent increases your susceptibility of developing a respiratory illness due to the dry air. The HVAC technicians with LIBERTYAIR will test the indoor humidity levels in your home or business to create a customized plan to improve the humidity levels with the use of either humidifiers or dehumidifiers. You may love the scent of cucumber melon products but the majority of popular fragrances from air fresheners, candles, and cleaning products are synthetic. Many synthetic fragrances are produced from petroleum products, while others use dozens of chemicals that emanate into the air when used. Instead, reduce or eliminate your use of these products and use plants or essential oils to maintain healthy indoor air quality levels. A clean home or business does more than create an appealing environment — it also has a higher IAQ level. Vacuum carpets and rugs at least once a week along and be sure to mop hard surfaces. Placing floor mats at each entryway is a great way to cut down on the amount of dirt and outside debris that is carried inside by foot traffic. Make it a habit to clean these mats on a regular basis. If you have pets indoors, remember to vacuum and clean upholstered furniture to remove dander and fur, which are known allergens. When it’s time to clean your kitchen, be mindful of the self-cleaning option on your oven. As the oven cleans, leftover food burns which may release carbon monoxide into your home. Instead, look up a DIY oven cleaning hack and avoid releasing harmful gases into your home. Whether it’s tobacco smoke or smoke from a wood-burning fireplace, these actions release many harmful contaminants into the air. This also includes many soft wax candles, such as those made with paraffin. Designate your building or home as either smoke-free or require all tobacco use to be done outside. If you use a fireplace or burn candles, make sure the area has ample ventilation to disperse soot and smoke outside. Also, ensure to turn on your range hood so the vents can remove indoor air pollution that is often produced when utilizing a gas stove, namely carbon monoxide and nitrogen dioxide.